The licensed Yoshiwara pleasure quarters of Edo (Tokyo) bustled at night, but at daybreak it was time for friends and lovers to part. With the sun rising behind them, the figures in this print are framed by the Omon Gate, the Yoshiwara’s single point of entry and exit. The man departing has his head covered for the journey and the tall black clogs (geta) of the woman in red behind him identify her as a high-ranking courtesan. 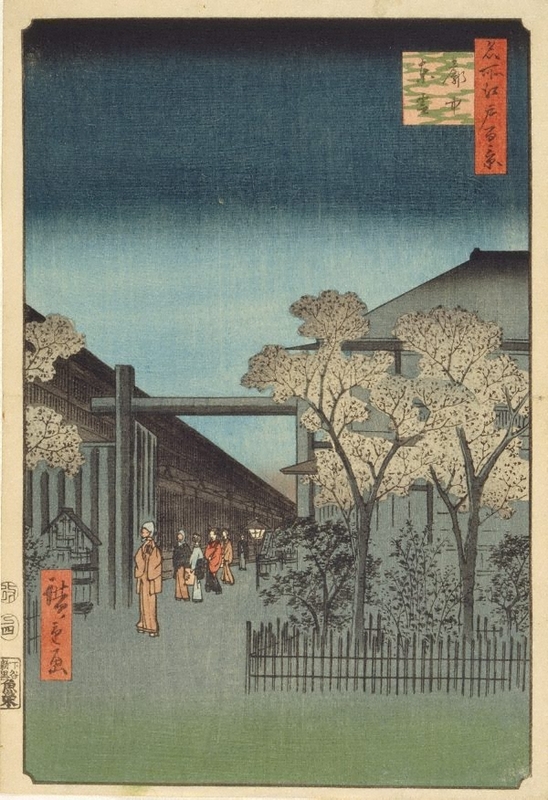 This print is from the renowned artist Hiroshige’s final series, One hundred famous views of Edo (1856–58). Gary Hickey, Beauty & desire in Edo period Japan , 'Pleasure Town', pg. 25-36, Parkes, 1998, 24 (colour illus. ), 25, 70. fig.no. 17. In this publication this work is titled 'Kakuchû shinonome [Dawn in the licenced quarters]'.